Splicers® is a dark world of the future where a nano-plague has made touching metal deadly and humans are forced to use genetically engineered, living weapons and organic war machines to battle N.E.X.U.S., an insane Artificial Intelligence and her legion of robots and monstrosities. 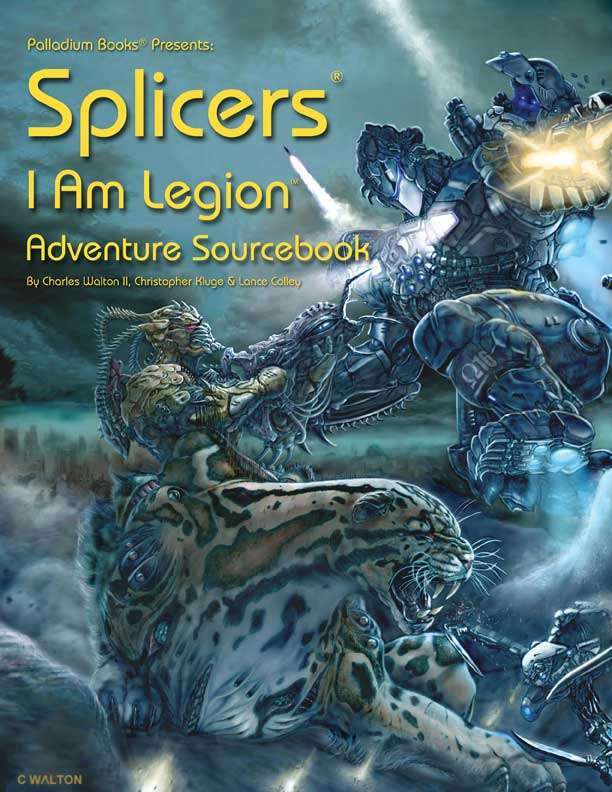 This big, 256 page adventure sourcebook for Splicers® is jam-packed with new Host Armors, War Mounts, Bio-Enhancements and adventure galore. Your heroes must uncover the mad schemes of the new N.E.X.U.S. personality that calls herself Legion. Then battle her army of robots and Amalgams every step of the way. If you fail, thousands will die. 6 new Splicer War Mounts. 7 new Bio-Enhancements and augmentations. Amalgam Creation Tables, new alien predators and more. Legion: A psychotic, new personality of N.E.X.U.S. An epic series of adventures, plus adventure ideas and more. 256 pages written by Walton, Kluge, Colley and others. This was the first rpg I ever bought, way back in like the early 200's. Can't believe there's new content for this amazing setting, outside of the stuff in the rifter of course. Thanks guys! Glad to see original PDFs out there. Can’t afford this now, but will get it later. So this is not the preview version? It includes all the artwork of the print version? Finally glad to see more Splicers out there. I hope they get Genetic Expressions and Blood and Iron printed. Will this be available print on demand? They'll be selling the print version through their regular distribution network, and as of their update today (6/14/2018), it is currently at the printer.